This machine was B&O’s first DVD compatible product. At first is seemed a little ordinary, and while it boasted more elegant styling and nicer detailing than many of the alternatives from other manufactures, it was still just a little square box with a drawer in the front. B&O’s trump card though was of course the Datalink system, still impressively intact after over 10 years. This enabled the DVD 1 to be added to many Beovision models and controlled with their terminals, not just the current models. Owners with Beolink systems even found that they could add a DVD 1 to their “master” TV set and watch the discs anywhere on the system. Wisely, the software in the DVD 1 made it behave like V Tape 2, so any Beovision with a double AV interface could control it directly. Some of the more elaborate sets, such as some Beovision Avants, required a software change, though the design of the set meant that this was not difficult. Even owners of older sets such as the Beovision LX 2802 could use the DVD 1, though a special cable would be needed. Text copyright © Beocentral. Unauthorised reproduction prohibited. Numerous connection sockets could be found on the rear of the DVD 1, though of course only the 21-pin AV connector would be of any interest to the serious B&O user. A quality AV cable was provided with each machine. Other connections included separate L/R audio, component video and an optical digital connection, for use with non-B&O equipment. A small switch on the rear selected between CVBS, RGB or SVHS type output signals. Text copyright © Beocentral. Unauthorised reproduction prohibited. The optical deck and decoding sections of the DVD 1 were made by Philips, the same firm that had provided technology for the Beogram CD X, the first B&O CD player. Results were good, and they needed to be to be displayed on quality sets such as the Beovision range. Text copyright © Beocentral. Unauthorised reproduction prohibited. The DVD 1 was a perfect match for the V 8000 video recorder, and a typical system would have been a Beovision MX 7000 television and both of these machines, perhaps in one of a range of stands and cabinets made for the purpose. Both the DVD 1 and the V 8000 were made with metal cabinet tops in colours to match the MX range, the overall effect being very pleasing. The arrival of BeoVision 3 in 2001 provided yet another tempting option. The base of the television was made to be the same width as the DVD 1, and a beautifully designed rack to hold the television and DVD/VTR machines was made available, forming a compact and mobile widescreen video centre. Text copyright © Beocentral. Unauthorised reproduction prohibited. 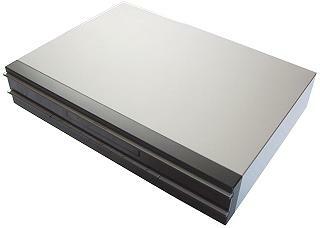 In early 2004 the introduction of a new DVD drive made by Pioneer of Japan (first used by B&O in the BeoCenter 2) meant that the machine had to be redesigned. Basic functions remained similar but the new models could be recognised by the different and slightly more elaborate on-screen menus. There was also a marked deterioration in the quality of the cabinet work, though the price remained fairly constant. Text copyright © Beocentral. Unauthorised reproduction prohibited.